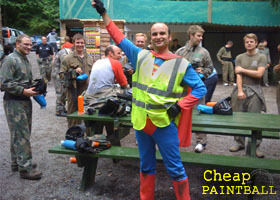 Cheap Paintball UK are offering a full day of Paintball for £9.99 including 100 paintballs! Not only is Paintball a great activity for building team work, its also a good chance to cover the Bride or Groom in paint! Brides and Grooms have been playing at our venues all over the UK for years, our venues have 25 years experience providing Stags and Hens with the best day of activities before the night out!